Ready-to-Go Radio The wall/desk stand is easy to use and keeps the charger cable neatly tucked away. The stand bottom opens and you can roll in the rest of the cable, resulting in no tangling wire. Light Your Way The built-in LED flashlight gives you peace-of-mind during evening adventures, unexpected emergencies or power outages. The flashlight also automatically turns on during a blackout and when unplugged, so you always have light during an emergency. Emergency Light Source A light source is always essential during any emergency situation. It's crucial to be able to see what you are doing and where you are going. This radio has a built-in LED light, which offers emergency lighting when needed. Charge Quietly Dont Miss Alerts Quiet Charge allows you to charge the radio and turn off calls. You will still receive weather and emergency alerts, so you don't miss important information. IP54 Weatherproof With the IP54 weatherproof design, the radio withstands the effects of rain, snow and other weather conditions. 22 Channels Each with 121 Privacy Codes With 22 channels and 121 privacy codes, totaling 2,662 combinations, it is easy to find an available channel. Know the Weather In Advance Keep updated with real-time weather conditions by turning on the weather channel or initiating weather alerts. With these capabilities, you will always be prepared for the unexpected. NOAA radio service may not be available in all areas. Light Your Way The built-in LED flashlight gives you peace of mind during evening adventures, unexpected emergencies or power outages. Quickly Ask for Help When in danger, easily ask for help. Press the emergency alert button, and the radio will transmit an alert siren followed by spoken or incidental sounds. This will allow others to know that you have an impending danger. Power Through Your Adventures There are two ways to power your radio. You can use NiMH rechargeable batteries included for up to 10 hours. Or use 3 AA batteries on the go for up to 26 hours. There are three ways to charge the NiMH rechargeable batteries. You can connect it to your vehicle adaptor or your computer, or plug the micro-USB cable into an outlet. Extra Power When You Need It Most Push-To-Talk (PTT) power boost allows you to extend the transmission range by increasing the transmitter power output. It also saves battery life when no power boost is necessary. Be Hands-free When hiking up a steep mountain trail, keep your hands free to brace the rocky terrain. With iVOX/VOX acting like a speakerphone and allowing hands-free communication, you can keep on moving without stopping to answer a call. Customize Call Tones Choose what your callers hear before you start speaking by selecting one of the 20 call tones, including animal sounds and ring bells. Play Is Convenient and Discreet Use the earbuds to speak and listen to other radio users. It comfortably fits in your ear and snaps to your clothes. Experience unrestricted and discreet communication while out in nature. Keep It Private The Quiet Talk (QT) feature ensures uninterrupted communication with other Motorola radios that also have this feature. Filter out unwanted transmissions from non-Motorola radios in heavy traffic areas such as ski resorts or amusement parks. Compatible With Any Radio You can communicate with other FRS/GMRS radios regardless of brand by being on the same channel and privacy code. Eco Smart Most of the energy wasted when using a mobile device occurs during the charge. The T480 consumes only a half watt of power during its idle condition. Quickly Find a Channel Use the scanning feature to see which channels are currently in use. Set your radio to transmit a unique tone when you finish talking. It's like saying "Roger" or "Over" after you talk. Get Low Battery Alert Get a reminder when batteries are running low. Keep Your Preferred Settings Lock the keypad to prevent your personalized settings from being inadvertently changed. 4 Micro-USB wall charging cable. How far can I expect my radios to communicate? The communication range quoted is calculated based on an unobstructed line of sight test under optimum conditions. Actual range will vary depending on terrain and conditions, and is often less than the maximum possible. Your actual range will be limited by several factors including, but not limited to: terrain, weather conditions, electromagnetic interference and obstructions. All questions/comments are routed to a mobile device, so you WILL receive a very quick response! All items must include original packaging to receive a credit. 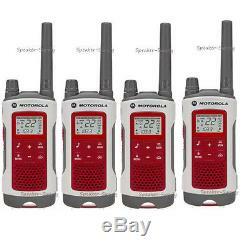 The item "4 Motorola Talkabout T480 Walkie Talkie Set 35 Mile Two Way FM Radio NOAA PTT" is in sale since Tuesday, September 29, 2015.